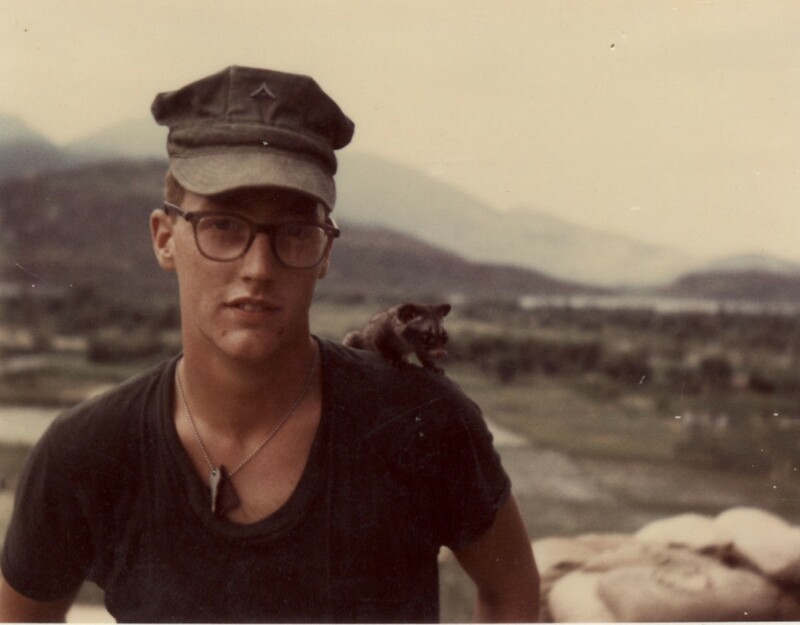 While serving in Vietnam with 3/1/1 in 1968, I acquired a little friend. My last name being Mongar, I was given the nickname, “Mongoose”. Seems that the kids in a local ville that we tromped through occasionally, heard me being called, “Mongoose”, and next time through, they presented my with this very young mongoose. After my first day of carrying this little critter around, it never left my side. The little thing met it’s Waterloo during a mortar and rocket attack in Elephant Valley, in June or July of 1968. It was an experience I will never forget, one of those things that happened in Vietnam that can never be repeated. Was with 3/5 india co. 67/68 1st.Plt. that story made my day marine. Thanks.Semper Fidelis. Cpl. Conley. In 1969, I was with 3rd. Plt. of K-3/9 on the tail end of operation Dewey Canyon in the Ashau Valley. Later we moved to an overlook position on hill 950 looking at the old Khe Sanh airbase that had been there a year before. A lot of unfriendly villagers there. NVA too. Most of the animals I saw wanted to eat you and we were always on the move with a lot to carry so no pets. I can understand getting attached to a dog. I think the Vietnamese ate them. S/F. I was with India 3/1 69-71 and on Hill 190, north of DaNang, for a spell. There was a dog who had 2 puppies and they were with me. Snaggletooth and Snowball. An order came down from division that any dogs within a company had to get rabies shots. The company gunny wouldn’t let me get them back to the rear, so I was ordered to give them up to the locals. I knew that they would end up eating them. The Div. CG was on a visit to the company and I asked him about the order. He said it was true, so I asked him if he would take the pups. He told me that he would take one of them. I gave him Snowball. I ended up taking Snaggletooth up on the ridge line and shot him, rather than give it to the googs. To this day I think of him. They were the one link I had to humanity with all the insanity of the war. I served with Charlie 1/5 and CAC India from June 66 to July 67. Left from Danang July 4th by ship. There was a Marine on board with a Vietnamese dog that had orders to go home with his Marine. The dog had dog tags and a Purple Heart. Apparently had saved his Marines life, The Marine’s parents had wrote some congressman, so the dog had orders to come back to the World with his Marine. True story, I was there. Troy, Morris. I was in C 1/5 Oct 66, Nov. 67. Are you on the mailing list for the 1/5 reunion? Jim Coxen. .I am a member of the !st Marine Div. Asso. !/5 Vietnam Veterans . I served with C 1/5 from late June 66 to late Dec. 66. Lt. Buck Darling was the C O. A CAC unit was formed from Marines of 1/5 in Dec. , and we were located north of Hill 54 and west of Tam Ky. The last reunion I attended was in Washington D C in 2004. I got to meet Buck’s wife and his two sons. Also got to talk to Bn. C O Colonel Pete Hilgartner and Lt. Gen. Art Blades, who was one of Buck’s platoon commanders at the time. Unfortunately Buck passed away in June two months before the 2004 reunion at age 63. What a great company commander he was. We would have followed him anywhere. In 1966, I was re-assigned to an outpost 106mm gun crew (1/7) at Lantry Hill, somewhere around Chu Lai. The crew already had a small puppy as a pet. After a while the word came that we had to get rid of the dog, supposedly because the dog barked at an inspecting/visiting Lt. The five of us discussed what to do with the dog and the consensus was give it to the local kids who we thought would keep it as a pet. The next we heard was that all of us were invited to partake of the meal at the village below the hill. Of course, all were mad at what had occurred, only Barber and I decided to attend. The dog had been drowned and I recall meat and intestines cooking on an open fire. We both managed to eat a small piece so as to not offend the Vietnamese, but quickly departed. I was told by several Marine buddies who served in Nam that the ‘American K-9 dogs were for the most part killed even if their field partner wanted to take them back stateside Was that true? Thats pretty cool. What company were you with, I was with 3/1 also? I served with 1/5 from Nov.’66 thru Dec.’67 – I was an S2 scout and the battalion Kit Carson team. I’ve never connected with any of the Marines that served in S2 and I don’t remember any names from the Marines in the line companies, but I did go on patrols and operations with every company. I do remember Col. Hilgartner as a tall slender Marine (we all got “slender” after a few months), thanks for the memory. Col. Peter L. Hilgartner passed away on the 8th of Jan, 2015 had age 87. He wrote a book, Highpockets War Stories with Sam Ginder. High Pocket was one of his nicknames along with The Dragon. A great Marine and a very effective infantry Bn. Commander. C O of 1/5. My Loc Qua Viet River 1968 my buddie had dog L/cpl Brenenger this was a really small dog . When we moved out side of Camp Carrel we told not to take any pets: IE dogs. We also had to police the area, trash was put in sand bags. I was on a different Chopper (34’s) and was handed a lot of sand bags. As we flew along the Dong Ha or Cam Lo river the crew chief told me to kick the bags out in the river. I did. Landed at Carrel and humped to the bridge and set up L/cpl Brenenger ask me where his dog was. I said, “What dog?” The one I put in the sand bag.” I told him the crew chief kicked them in river. I think of that poor dog a lot. I hope it made it. Brenenger was hopping mad.